Purple Martins are attracted to houses with multiple apartments to establish colonies. 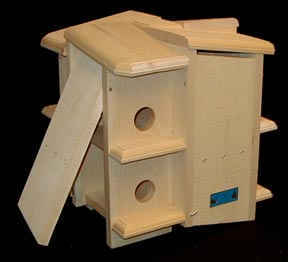 This birdhouse provides 8 nesting spaces opening on four sides for easy cleaning. This large birdhouse mounts securely on a pole. Purple Martin Birdhouse size (18"h x 17-1/2"w x 17-1/2"d). Made from eastern white pine.